In 2004, Conor Grennan had no wife or children, and had saved some money. So he decided to take a year off work and travel around the world. This sounded hedonistic, he realized. To mitigate the appearance of self-indulgence, he began the trip with three months in Nepal, working in an orphanage. What a good person he would be! How highly his friends and family would think of him! What Grennan didn’t expect was that he would become deeply moved by, and then deeply involved in, the lives of the children he was helping to care for. These kids were mostly boys. Because Nepal was embroiled in civil war, and because insurgents were grabbing up boys to make them unwilling soldiers, there was no telling what could happen to children. Insurgents planted bombs, went into schools and killed the teachers, and then took the kids. To avoid a terrible fate for their children, parents would give them up to child traffickers in the belief that they would have better lives—the people taking them would promise that they received an education and would be well cared for. The truth was grimmer. Although the parents often paid what was, for them, large sums of money to have the kids taken, the children wound up as house slaves or street beggars, half starved. Those who were lucky landed in orphanages after being taken from the child traffickers. These orphanages were run by non-profit organizations which would care for the kids, educate them, and try to reunite them with their parents. ‘Little Princes’ is one of those orphanages, named after the fanciful novel by Antoine de Saint-Exupéry. 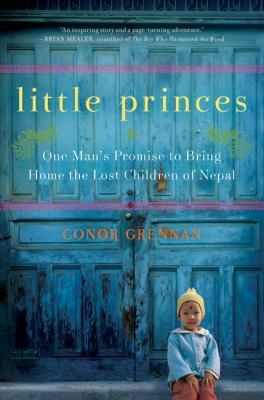 Grennan relates stories, both tender and funny, of his experience at Little Princes, where he enjoyed children’s antics for the first time. In fact, he was so moved by his experience that after his trip around the world, he came back to Little Princes for another 3-month volunteer stint. And when he learned that most of the children weren’t really orphans, he decided to go home and start a non-profit organization—Next Generation Nepal—with the goal of reuniting the lost children with their parents. By 2006, Grennan and others from an organization with a similar mission set out on a dangerous journey in search of the parents of the ‘little princes.’ They were also seeking the families of other children Grennan had met and wanted to help. Nepal was never safe for travel outside of the typical tourists’ areas. (Nepal is in the Himalayas, with some of the tallest mountains on earth. Hikers come from all over the world to climb those mountains, so there is more tourism than you’d think.) Maoists were demonstrating in the street. Police were shooting protestors. A revolution had begun. Grennan and his colleagues hoped that a fragile cease-fire agreement would hold as they searched. In addition to the adventure element of the story, there’s a sweet romance. Conor maintained an online relationship with a woman who was interested in his new non-profit. Over time, they came to know and respect one another and fell in love. High school housekeeping: Little Princes is both inspiring and sweet—a happy ending kind of story. As you read, you’ll learn a bit about Nepal, one of the poorest countries in the world. You’ll get a sense of the difficulties of living in a war-torn country. All of this interspersed with the details of dangerous adventures and a quiet love story. There’s a lot to like. Pick this one just for pleasure, but also when a teacher assigns an inspirational book, a memoir (and if you fudge a bit, it’s great for a biography assignment as well although it doesn’t cover the author’s childhood). Very much recommended. This entry was posted in Adventure Stories, Biography/Memoir, Faith-Based/Religious Element, Human Rights Issues, Non-fiction and tagged Adult books for teens, adventure stories, autobiography, biography, book reviews, child trafficking, Common Core standards, Conor Grennan, Himalayas, Little Princes, memoir, Nepal, nonfiction, orphanages, orphans. Bookmark the permalink.